Judging by the traffic flow through this site, one of Chevrons and Diamonds most popular features for readers is the Archive of Military Baseball Uniforms. Since it was established with a dozen jerseys and uniforms (including those in our own collection), it has grown tremendously as we add pieces that surface (and, hopefully, we catch them when they are listed), capturing photos and researching their designs, features and the associated assertions or provenance regarding their history. As of publication of this article, there are currently 19 items, with at least one queued up to add to the line-up. It should be prefaced that the critical commentaries regarding the pricing employ a measure of supposition and assumption (coupled with a small dose of sarcasm) while not taking anything away from the sellers’ rights to ask what they deem necessary. In the last two weeks, we have observed three noteworthy jerseys listed at (online) auctions and there is a noticeable, if not just a negative trend with the sellers’ valuations. In September of this years, that upward trend of listing prices with the spate of wartime and mid-century Marines jerseys was noted with our article, Marines Baseball: The Many. The Pricey. – all of those jerseys remain unsold and relisted week after week. In the past decade, jerseys used by the Marines are the overwhelmingly market-dominant artifacts within this arena which causes anything different to stand out. This humble Navy jersey, though lacking provenance or attribution (to a named player) garnered respectable interest from collectors, achieving a final bid price at just over $200 (source: eBay image). Aside from the scarcity of baseball uniforms from the U.S. Army Air Forces (or its predecessor, the U.S. Army Air Corps), U.S. Navy pieces are a rare breed among wartime flannels. Two weeks ago, as an auction for a WWII Navy jersey was nearing its closing, the bidding drove the price higher from its $9.99 opening bid amount. After a ten-day run, the 21st and winning bid of $204.02 was a reasonable and sensible, considering the infrequency that any vintage Navy jerseys come to market. Among collectors in genre, the Navy jerseys that are on their wish lists are those that were used in the Pre-flight schools, used by the Norfolk area teams in 1942 to early 1943 and those that were on the Hawaiian and Pacific Island diamonds in late 1943 to late 1945. The Navy flannel in the recent listing was clearly not from any of these teams or games. Granted, the chances that one of those jerseys of having been game worn and used by a major leaguer are very good, but only one of them has surfaced in the last decade. Reminiscent of the ridiculous asking prices of the aforementioned Marine Corps jerseys, not wanting them to be uniquely or alone in that sphere of insanity, the next two additions to the Chevrons and Diamonds archive, while they are quite fantastic pieces that would be fantastic additions to a military baseball collection, they are priced in a sphere well above reality. Both pieces were used by army personnel. one domestically and the other overseas, the sellers are either gouging and seeking to wait countless months, renewing their auctions repeatedly after the passage of each six-day segment without a bite – or – they simply do not understand the value of these items. Bear in mind that in recent months, there have been two 1940s (WWII-era) major league jerseys sold at auction, both worn by unknown players and have sold in the neighborhood of $200-$250. It is appropriate that these two jerseys, one from WWII and the other from the early 1950s and both from unknown players (most likely just average “Joes”) should be valued in the $75-100 range, when correctly compared with historic major league pieces. Though this 1950s U.S. Army jersey from Wiesbaden, Germany is truly a beautiful piece, the asking price ($300) is about $220 above reality (source: eBay image). Of the two Army jersey listings, one from the joint Army and USAF bases at Wiesbaden, Germany, is incorrectly listed as a World War II era piece. Since the War ended in 1945 and the base, a captured and converted Third Reich military facility, effectively began functioning as a U.S. base in 1946. While one might consider this fact a mere technicality, if the jersey was used in that or the immediately subsequent years, the features of the jersey itself give away the actual era (the 1950s). Listing the jersey as a buy-it-now with the price, $2 shy of $300, the seller is trolling for an ill-informed buyer (a sucker) who will bite on the fantastic design and excellent condition of the flannel. However, the seller left the door cracked for more astute buyers, indicating that a best offer will be accepted. Doubts remain as to the reasonable nature of an offer that would be deemed acceptable by the seller. Despite all of the pricing discussion, the jersey itself is a fantastic example of post-war design and the influence of the major leagues cascading down to the trenches of the military game. By the start of the 1955 season, the Dodgers was established as the dominant National League franchise, appearing in (and losing) five World Series since the end of WWII. The Wiesbaden Flyers jersey borrows many elements of Brooklyn’s uniform styling from this era, making it quite aesthetically appealing, though not for $298.00. As of publishing this article, the overpriced Wiesbaden jersey remains available. The signs of usage (stains, wear marks) don’t take anything away from what is a great piece of military baseball history. However, what makes this jersey wholly unappealing is the insane asking price ($600) that is $500 too high (source: eBay image). Not to be outdone by mere pretenders, another seller recently listed a vintage, WWII-era jersey that, aside from the unrealistic market expectations, is an otherwise fantastic piece. Listed with a single purchase option, the $599.99 (at least one needn’t spend a full $600 on sale price! The buyer gets to keep that $0.01 in his or her bank accounts…save for the $12.90 shipping charge) is beyond ridiculous and has edged to the realm of insanity. The road gray flannel clearly dates from the 1940s and, based upon the design, its age places it more from the World War II-period. The two-color block lettering that presents the base-name (Fort Lewis) in an arc across the chest is stylistically representative of what can be seen in most World War II uniforms. Other features of the jersey includes the vintage U.S. Army logo patch on the sleeve and the chain stitching across the back which might be the basis for the seller’s exorbitant selling price. Rather than having a game-worn jersey from a player, for a penny under $600, one can acquire a jersey worn by the most legendary figure from the Fort Lewis baseball team; its mascot. The short window of time that this jersey was available has expired and the seller has not yet re-listed the piece. It is almost a shame to show this jersey in the same company as the two previous Army flannels. This piece is the nothing short of being genuinely historic as it is connected to a legendary team that was one win away from winning the ETO World Series title (image source: Goldin Auctions). The last of the new entries for the Chevrons and Diamonds uniform archive truly is a piece of history that, for obvious (to military baseball fans) reasons, garnered the interest and the considerable final bid amount. Aside from the articles published to this site, the 71st Infantry Division’s Red Circlers ball club was one of the legendary teams that reached the pinnacle of the European Theater of Operations (ETO) 100,000 players strong baseball league. Despite losing to the Overseas Invasion Service Expedition (OISE) All Stars in the championships, the squad from the 71st was noteworthy having a roster filled with talent from both the major and minor leagues. Adding to the collector interest is that both pieces in this uniform group are named (to two separate team members) along with rock-solid provenance. Rather than see this group lurking in the shadows of the often-times seedy breeding grounds of nefarious activities (known by the simpler name – eBay), this group was listed with a reputable auction house. Seeing an historic baseball jersey sell for more than $2 million is mind-blowing. Knowing that the sale price of the only surviving game-worn jersey from Jackie Robinson (from his 1947 rookie season) fell considerably short of the pre-auction estimate (in excess of $3M) and yet it broke the auction house’s previous record for a post-WWII jersey (Sandy Koufax’s 1955 jersey sold for $573,600) is even more awe-inspiring. While these legends’ jerseys will continue to garner riches when they come to market, the uniforms of utility players are valued at mere fractions of the select few elites from the game’s history and lore. To contrast, a recent auction for a jersey from (then) San Francisco Giants Hall of Fame outfielder, Willie Mays sold a few days prior (to Jackie’s auction close) for a mere $701. Yet another jersey from Hall of Famer, Nolan Ryan (from his 1986 season with the Houston Astros) garnered greater interest selling for more than $10,700 shows how wide-ranging game worn apparel pricing and interest can be within the collectors’ marketplace. The same holds true for those who collect militaria, or more specifically, military baseball. A uniform grouping from a notable general, admiral or decorated service member can garner considerable collector interest as the sales can reap four and on rare occasions, five digit returns. The perceived value of their uniforms are impacted depending on what the veteran did during their service (valor decorations earned, battles that they participated in, etc.). One of my favorite uniform groups (owned by a friend and fellow collector) is that of Rear Admiral Robert W. Copeland who sailed his ship, the USS Samuel B. Roberts headlong into battle against the Japanese battle group, led by the Yamato in the Battle off Samar. His actions ultimately saved the American carrier group that he was protecting by inflicting damage on the Japanese (though his ship was destroyed). The Copeland group would be worth a few thousand dollars to collectors though to me, it is priceless and would be well-received into my collection (he and I share the same hometown). Copeland received the Navy Cross, the Navy’s highest decoration for combat valor (beneath the Medal of Honor) for his heroic actions. It is difficult to compare uniform groups’ values; the service of a veteran such as Copeland is far more noteworthy than that of one of my own relatives. I would never sell a uniform from my family’s history thought if that were to be a need, I would have to price it comparable to other comparable groups. To me, my uncle’s service and history is priceless but that doesn’t translate to a fellow collector having the same association with the items nor would they be willing to pay a premium price for an otherwise humble military history and uniform. When I saw this listing, I was intrigued. I initially made the assumption that the veteran must have been a Hall of Fame player due to the $5,000 asking price (image source: eBay screenshot). This uniform grouping is quite intriguing for collectors of military baseball. I assume that the black flannel “A” represents “Army” however there is an absence of any other direct evidence that these two pieces were used for a military ball club. Even the photograph provided by the seller showed the veteran wearing a different uniform. One has to use judgement regarding the provided provenance (image source: eBay image). $5000 is a lot of money for most collectors, regardless of their income or how much they have invested into their collection (through buying, selling and trading) throughout their years in this hobby. Understanding what factors drive collectors’ interest and how they value items would help sellers be more prepared when deciding to part with artifacts and in particular, family history. What value can be placed upon provenance in relation to an historical artifact or object? How does one arrive at a valuation of an artifact? How much is an item worth? These questions perplex those who are in possession of antiques, especially when the time comes to decide to downsize a home and pare down collections to a more manageable size. Often, surviving family members left with the considerably uncomfortable task of liquidating a loved-one’s estate grew extremely wearing from wading through a lifetime of personal effects, documents, household items and other pieces in preparation for clearing a home for sale. In many cases, one (or both) of the elder individuals are being relocated into long-term care and the value in the estate is the only means to provide a means to exist in the new care facility. Any object that has monetary value must, from the vantage point of those performing the liquidation, be maximized. Those familial artifacts that I have inherited possess significantly more than monetary value to me. The military-specific artifacts that I have in my collection that originated from my grandfather, uncles, etc. aren’t necessarily rare or highly desired by militaria collectors however to me, they are priceless. Many items from my uncle’s service ended up being donated or sold in an estate sale before I had the opportunity to lay claim to them. The most desired (by me) pieces from another relative’s estate (who was an avid militaria collector) were essentially given away for nothing (to the estate seller) after I made the decision to leave them off my want-list. My list was prepared by me with the understanding that I would compensate the estate for the honest valuations that I assigned to each object. The most valuable artifacts were omitted from my list due to my limited funds to pay for them. Those items went unsold and the estate seller kept all unsold items and I received everything on my list, free and clear. I have written several articles about baseball uniforms, jerseys and equipment that I would have been honored to be the caretaker of, showcasing these pieces among my collection. These artifacts are often listed, considerably overpriced by most collectors’ standards. On some occasions, I encounter listings where the seller over-values their pieces with prices that are on par or exceed the value of artifacts from legends of the diamond or the armed forces. Considering the importance that I place upon historical objects from my own family as well as my experiences in selling historical objects in order to fund assisted-living care, it is with that understanding that I don’t initially and negatively react to (these sellers’) exorbitant prices. Several weeks ago, I had such an experience with a family member charged with a similar task and with the goal of working to pay their deceased-veteran family member’s estate debt. After spending the better part of eight-ten years observing, documenting and purchasing World War II and older military baseball uniforms, I have a solid understanding of their value and what one should expect to pay or sell them for. In addition to my experience with these uniforms, I have paid considerable attention to game-used uniforms of professional ball players (including notable and Hall of Famers). I am often comparing uniforms and jerseys from both the military and professional teams of the same era (1940s) as they are very similar in terms of construction and design. The rear of the Karlsruhe, Germany 12th Anti-air Artillery group baseball team jacket (image source: eBay image). The only tag in the entire group is within the jacket. I have not been able to locate any information for any brand or company name of “Dolomit” (image source: eBay image). The 1952 12th AAA EUCOM Western Conference patch on the right shoulder of the Karlsruhe, Germany 12th Anti-air Artillery group baseball team jacket (image source: eBay image). The 1951 EUCOM Northern Conference patch on the left breast of the Karlsruhe, Germany 12th Anti-air Artillery group baseball team jacket (image source: eBay image). The rear of the waistband showing moth damage on the Karlsruhe, Germany 12th Anti-air Artillery group baseball team jacket (image source: eBay image). The lining of the Karlsruhe, Germany 12th Anti-air Artillery group baseball team jacket (image source: eBay image). The auction title and description for the Post-WWII Karlsruhe, Germany baseball uniform caught my attention. The group of baseball militaria included a wool flannel jersey and matching trousers along with a wool letterman-style jacket. The jersey was plain and had a large black flannel “A” on the left breast and numerals (“15”) on the back and double black soutache surrounding the sleeve-cuffs, collar and placard. The trousers lacked embellishments and both garments were devoid of manufacturer’s tags and quite soiled. The most desirable item in the group was the jacket which was a burgundy-colored wool shell, lined with a tan satin material with tan-colored elasticized cuffs, collar and waistband. What really makes this jacket noteworthy are the two dated patches (one affixed to the left breast and the other on the right shoulder) from EUCOM Northern and Western Conferences (1951 and 1952). The front of the Karlsruhe, Germany baseball uniform shows the flannel “A,” black soutache and heavy soiling (image source: eBay image). After an email exchange with the seller, I was able to conclude that the veteran was assigned to either the USAREUR base at Smiley or Gerszewski Barracks in Karlsruhe, Germany. His group assignment was with the 12th Antiaircraft Artillery (AAA) Group of the 34th AAA Brigade. Leading up to the veteran’s activation and move to Germany, the Korean Conflict caused the Federal activation of several units from this service member’s home state of New Mexico. Along with the three AAA units, the ballplayer’s guard unit, the 717th AAA Gun Battalion was called to federal active duty. The battalion was first ordered to Fort Bliss, Texas where it remained until March of 1952 when it was ordered overseas to become a part of the 12th AAA Group at Karlsruhe, Germany. The patches on the baseball jacket show the 1951 and ’52 seasons which coincide with the veteran being “transferred to the Army Reserve on 20 October 1952,” according to the seller. Condition is always a factor for vintage collectibles and all three of these pieces have overall minor issues. The jacket’s waistband is has moth-damage on the rear of the garment. For some collectors, the evidence of game-use is a plus while others enjoy pieces to be clean and fairly free from permanent staining. Some of the garments in my own collection have very minor usage stains which by comparison (to the Karlsruhe uniform) are all pristine. I have my doubts as to how much these pieces would clean up when properly laundered after 60-plus years of being stored while filthy. The back of the Karlsruhe, Germany baseball jersey showing the flannel numeral (image source: eBay image). The trousers of the Karlsruhe, Germany baseball uniform showing heavy soiling (image source: eBay image). With each new military baseball uniform that I see, these two-hole convex buttons are very common (image source: eBay image). As with many military baseball uniforms, this jersey (and the associated trousers lack manufacturer’s tags. The black soutach encircles the collar and runs down the front of the placard (image source: eBay image). After some nice exchanges with the seller regarding the auction description (it had several misleading and erroneous details) and what proper valuation should be, the auction was relisted one additional time and remained unsold. Without a doubt, the seller was disappointed that there were no buyers who placed the same value upon this veteran’s items and so, decided to take another approach. Hopefully, there was a family member who saw that the real value in these items were that they should remain in the care of the family and the documentation that I provided to them (the unit and veteran’s history and instructions in how to obtain the specific details of his service) will help to properly tell the veteran’s story for future generations. I remain ever vigilant watching for these historic military baseball uniforms, hoping that they find their way into the hands of collectors who see both the military and baseball historical values as I do should I be incapable of landing them for my collection. I also hope that family members are able to see past the emotions in order to properly gauge the market value in order to achieve their goals. Like many returning World War II veterans, this sailor’s uniform was adorned with a ruptured duck patch (the small yellow patch located on the right breast) indicating that he had been discharged from active duty. The patch emblem, for a collector of WWII military uniforms is one that is very familiar. However, unlike the regulation sized patch that was sewn onto the uniforms of discharged veterans returning from war service, this patch was several times larger and was sewn onto the players’ baseball uniform sleeves (on the left). My first encounter with the Ruptured Duck insignia was when my grandfather showed me his navy uniform when I asked about his time in the service during the war. I remember him smiling as he dragged it out from the closet and recalled some of the good, light-hearted stories. Having seen my grandparents’ wedding photos, I knew that he wore it on their wedding day. The first time I heard the Ruptured Duck term from him while describing the rating insignia and ribbons, for some reason, I never questioned why something that clearly looked like an eagle carried such a disparate nomenclature. War-weary veterans returning home from service had only their uniforms (and any souvenirs they may have acquired) in their duffle bags. Upon their discharge, veterans were issued the Ruptured Duck patch to sew onto their uniforms which afforded an easily recognizable mark to indicate that they were no longer on active duty. Recalling my own time in service, a sailor, marine, soldier or airman is always on duty and therefor available for any ad hoc work detail that may arise. Imagine waiting for a standby seat aboard a military transport when a sergeant happens by to collect men to carry out a task and draws upon the idle men in the waiting room. Those wearing the Ruptured Duck could (if they chose) disregard the orders of the sergeant as they were no longer service members. There were other, more administrative reasons for the patch. Upon seeing to photo of (a significantly larger version of) the patch sewn to a Chicago Cubs player’s uniform I was intrigued by what it could possibly indicate. I was intrigued to discover that the patch was an acknowledgement of the veteran status of this player – that he had served his country during the war to bring about an end to global fascism and tyranny – was authorized by Major League Baseball for wear on the field. Notice the players in his 1945 image of the Milwaukee Brewers club with the ruptured duck patch affixed to their left sleeves. There is some speculation as to why more players did not wear the patch on their sleeves. One prevailing notion is that by virtue of veterans wearing the patch, those who did not serve (either by choice or not being qualified for service) might have faced ostracization by the fans or even teammates or opposing players. 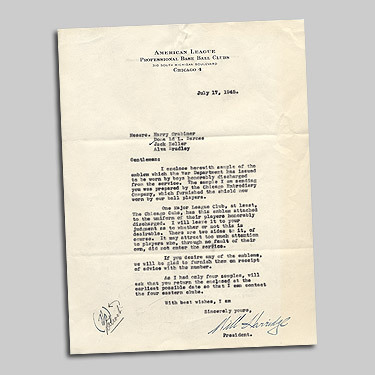 In a July 17, 1945 letter from the American League president that was sent to representatives of the four western American League ballclubs, Will Harridge wrote, “(the patch) may attract too much attention to players who, through no fault of their own, did not enter the service.” Harridge made mention that the Chicago Cubs had already moved forward with having players wear the emblem while leaving the decision to do so in the hands of each team. Regarding the patch itself, there has been a lot of preliminary discussion among collectors surrounding what was initially thought to be an existence of a few versions. My oft-repeated caution regarding collectibles that lacking provenance, one should never take a seller’s word as truth or fact (even if you trust that person). In the absence of supporting evidence, sellers may make whatever claims they want in order to sell the piece. In regards to these large ruptured duck patches, the same guidance applies. Version 1 – The white wool base is embroidered with gold stitching. The features of the design appear to be more flattened and the patch’s backing seems to be of a canvas material. The width of these patches measures 5-1/2 inches. Version 2 – This patch also has a white wool base however the backing material consists of a broad cheesecloth. The base material extends well beyond the gold embroidered outline and the details of the ruptured duck pattern appear more raised and contoured. White-backed Version 2 (source: US Militaria Forum). White-backed Version 2 reverse (source: US Militaria Forum). Version 1 – This patch is smaller (2-1/4 inches tall by 3 inches in width) than the three other versions. The overall design consists of a yellow canvas with a large-opening, cheesecloth backing. The image is embroidered in navy blue thread. The yellow canvas cloth with blue embroidery version is fairly common in online auction listings (source: eBay image). The yellow canvas cloth with blue embroidery version has a bit of a cheese-cloth backing (source: eBay image). Version 1 – The blue canvas base shares the same dimensions as the white-backed versions and has a white cheesecloth backing. The embroidery is a combination of both navy blue and gold thread forming the familiar eagle-shape and outline. The gold embroidery is employed as the base pattern with the blue embroidery providing the detail in the feathers and edges. This is THE ONLY version that has photographic evidence of major and minor league use following the end of WWII. Blue-backed Version 1 (source: US Militaria Forum). The cheesecloth-backing of the blue-backed version 1 (source: US Militaria Forum). Version 2 – This patch is very similar to the previous blue version with the most apparent differences being most discernible when comparing them side-by-side. The fronts of each has very similar embroidery work. However this second variation seems to be slightly more rudimentary as if it is an overseas-made copy. In my opinion, it this is a knock-off of the very rare version one of the blue (read: most-authentic) baseball ruptured duck patch. Blue-backed Version 2 (source: eBay image). The reverse of the blue-backed Version 2 (source: eBay image). Cooperstown Collection – This patch is about 25% smaller than the other patch variations and is fully-embroidered (rather than embroidered onto a backing material); by computer-aided embroidery equipment. It was made for the commemoration of the original (blue-backed) patch that was worn on major league baseball uniforms in 1945. The patch bears very few similarities to the original. They were affixed to the information cards when they were distributed. Beware that there are, on occasion, online action listings of these reproduction patches that have been separated from the collector card. The accompanying printed card provides a history of the insignia. The availability of these large (baseball uniform) patches varies but the most commonly listed (online auction) are the white-backed version 2 ruptured duck patches. One of my militaria collector colleagues worked relentlessly to research and document the history (manufacture, usage, etc.) of these over-sized ruptured duck patches reaching out to the Baseball Hall of Fame (in Cooperstown, NY) and to a manufacturer that was making these patches at the end of the war. In his conversation with the Hall, the archivists there indicated that the only type of the “baseball ruptured duck” in the collection was the blue-backed version. It is speculated that the white versions were made to be worn on the home (white) uniforms as the blue version was designed for the road (gray). However, photos show the ball players in their home whites with the blue ruptured duck. Others (including my colleague) have concluded that the white patch has nothing to do with baseball due to the evidence at hand. I, however, do believe that the white version was manufactured for the home white uniforms if, for nothing else, in anticipation of major league baseball requesting home and road differentiation. Perhaps the idea was set aside as the patches were unpopular and some clubs were not in support of their war veteran players standing out from those who didn’t or couldn’t serve? My colleague had a conversation with one of the online sellers of the white version 2 patches who disclosed an interesting fact regarding their stockpile of ruptured duck patches, “the box that they came in was an original World War II issue box with the original stock number.” However, the box has since been thrown out so I cannot get any manufacturer information from it.” The presence of a war department stock number indicates that they were most-likely made for the armed forces rather than for professional baseball. Unfortunately, there is no evidence to support the other versions as having ties to the game. Not long ago, my wife asked me what my goal was in terms of militaria and baseball collecting. I know that she asked this question with the utmost sincerity and respect for this interest that I have in these areas of history. The question is not something that I haven’t already asked myself in some manner or fashion as I try to understand what, within myself, causes me to look at different artifacts that become available. I often ask myself, “Is this piece in line with what you have been acquiring and researching?” I spend time analyzing what it is driving my interest in a piece before I start to consider the expense, space to preserve and house it or if the item is authentic. Space is at a premium in our home. We live in a modest (not small, but not large) and we have kids who also require space for their various activities which translates to not having an area for displaying artifacts. I have seen some incredible mini-museums that other collectors (both in the militaria and baseball collection areas of focus) that rival some of the best museums around the country. These collectors are so incredibly diligent, resourceful, patient and meticulous in acquiring the right balance of artifacts to create complete displays that convey the story while not overwhelming the viewer with sensory overload. Even if we had the space within our home, I am not certain that I would take this tack with my collection. In attempting to collect my thoughts to respond to my wife’s question, I wanted to convey to her (an myself) that what I focus my interest in is very specialized and that while the mailbox and front porch (at times) is barraged with a stream of packages (“is that ANOTHER piece for your collect?”), I don’t really have much coming to the house. This thinking could be construed as justification which is not what I want to convey to her. As I analyzed my thoughts, I wanted to mention that in terms of my highly selective focus leaves me wanting to preserve those artifacts that fit the narratives of my collection but also, if I didn’t purchase them, could be relegated to sitting in a plastic bin, long forgotten for decades. That too, sounds like an excuse. This past summer as I prepared to display a selection of my U.S. Navy uniform artifacts, I selected specific pieces to demonstrate the overall theme of the display. I chose to be limited in what would be shown, taking the less-is-more mindset. I could have filled the display case from top to bottom but instead, I wanted viewers to see each piece and enjoy them individually and as a whole. As I continue with my interests, this is the approach that I have been and will continue to take. That each piece that is added to my collection will be thoughtfully considered, individually as well as how it fits into what I already have. From the estate of a WWII veteran, this patch was thought to have been part of a military baseball uniform. I was unable to locate any visual reference to confirm that a patch like this was worn on any armed forces service team uniforms (source: US Militaria Forum). A few weeks ago, a patch was listed for sale (shown above) by a fellow militaria collector that received it from the son of a WWII veteran. Another collector suggested that the patch was worn on a baseball uniform as it resembled one that was common on major and minor league baseball uniforms, starting in 1942. Three variations of the Hale – American HEALTH patches in use from 1942 (Source: Uni-Watch.com). With the War in full swing and after suffering some substantial challenges (Pearl Harbor, the Philippines, Wake Island, Guam, the USS Houston, etc.) the United States was still ramping up to get onto the offensive against the Axis powers. Following the Pearl Harbor sneak attack, young men flocked to the armed forces recruitment offices, including in their numbers, several stars from the ranks of professional baseball. Leaders within all spheres of our nation (political, business, entertainment, churches, etc.) were almost unanimously patriotic and working together to hold our citizens and service men and women together for the common goal of defeating the fascist enemies. Aside from the rationing (food, textiles, gasoline, electricity) and recycling (predominantly metals) campaigns that commenced, recognizing the need for Americans to be physically fit and health-conscious in order to fight, build and farm – in other words, produce – for the War effort. Professional Baseball, in response to the call, embraced the physical fitness message and began to share it on their uniforms with the Hale – America Initiative Health patch. During WWII, major and minor league teams wore the Hale – America HEALTH patch on their uniforms (Source: MLB). This close-up of the NAS Jacksonville team photograph shows the shield patch with the obscured, smaller inset shield over the top of the vertical stripes. While I have found a handful of photographs depicting variations of the Health patch (a shield shape with stars and stripes) on wartime uniforms, I have only found one image with a variation of the patriot patch in place. In my growing archive of vintage military baseball photographs (numbering over a hundred) contains only a single image with players wearing a shield patch. The baseball uniform of the Naval Air Station, Jacksonville ball club, in addition to the beautiful chenille logo on the left breast, has one of the patches affixed to the left sleeve. Due to the high contrast exposure of the photograph, it is impossible to distinguish the variation – there is an unrecognizable inset shield-shaped (white) field that is centered, superimposed over the vertical stripes. This stars and stripes shield patch seems to indicate that the amateur baseball team uniform that it is affixed to dates from WWII (source: Mears Auctions). o my short list of to-be-researched militaria. However, I needed to be more discerning with my interests and, in answering the question in regards to my collecting goals, I passed on the opportunity to add the patch to my collection. I am still attempting to answer my wife’s question regarding my collecting goals with a well-thought out response however, I would assert that my actions just might speak more clearly than any words could offer. Militaria enthusiasts have long enjoyed collecting embroidered insignia – patches – since they began to emerge on the uniforms of soldiers, sailors and marines and airmen. From the earliest times when embroidered rank began to be a part of the uniform, someone has collected them. By the Great War when unit insignia began to propagate onto the olive drab wool uniforms (at the war’s end), collectors on the homefront were awaiting to fill their collections with the dozens upon dozens of colorful patches. This WWI Marine Uniform has a beautiful shoulder patch of the 11th Marine Regiment, 5TH Marine Brigade. I can imagine the young boy admiring his father’s old doughboy WWI uniform that he discovered tucked away in a trunk in the attic or perhaps even his father’s few spare (unused) unit insignia kept safely in a wooden box on the dresser. The young boy asks his father for one and dad lovingly agrees to hand one or two over to the interested son. The young son then shows the patches to his friend who also has a veteran father with a similar cache of insignia and a trade is made, igniting the popular aspect of the militaria hobby that continues to this day. It may just be my perception, but a seemingly smaller segment of patch collecting centers on patches that adorn professional baseball uniforms. In the 19th century, baseball uniforms were sparse in adornments. Some bore no indication at all that would lend to their team names or home cities. Uniforms in the earliest days might even lack color. As the game matured, uniforms began to be trimmed with piping, pinstripes and adorned with soutache (braiding encircling the collar, sleeves and the edged of the button-faces). Player numbers made an experimental appearance on the 1916 Cleveland uniforms (and again with the 1923 Cardinals) but wouldn’t begin to be widely adopted until the 1929 Yankees. Numbers on the uniform fronts started in 1953 with Brooklyn and though other teams have dabbled in this practice, only the Dodgers have remained consistent (the smaller red numerals remain on the lower right, at present). 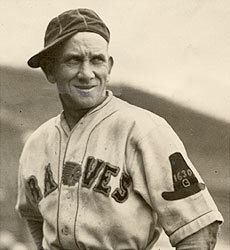 Rabbit Maranville of the Boston Braves, 1930 with the Boston 300th anniversary patch (image source: Baseball Hall of Fame). When the United States was drawn into WWI, Major League Baseball answered the call. Some teams began to visibly demonstrate their patriotism and support of the citizens (that were being called up to serve) by decorating their players’ uniforms with embroidered emblems stitched to their jerseys. Brooklyn and Chicago of the National League along with Chicago, Detroit, Washington, and Cleveland of the American League participated in 1917-18 with patriotic sleeve patches that were attached either to the chest or sleeves. With the start of the 1925 season, the National League set out to commemorate their 50th season with a patch to be worn by all of the NL’s teams. In 1930, both of Boston’s major league teams wore sleeve patches to pay tribute to the city’s 300th anniversary. In the season preceding when New York City would play host to the 1939 World’s Fair, all of the city’s teams (Dodgers, Giants and Yankees) wore a patch to recognize the event throughout that year. To mark the sport’s alleged centennial, all major and many minor league clubs wore a patch to mark the occasion. This jacket patch (still affixed to the jacket) is in pristine condition. Like the Mare Island and Kunsan patch, bears a similar baseball design with the year embroidered into the lower part of the ball (eBay image). This Marines baseball uniform made use of the WWII 1st Marine Division unit insignia, affixing it to the left sleeve as it was also worn on the the Class A USMC uniforms (eBay image). With the United States fully immersed in World War II and her citizens weary from the want of more than a decade of a depressed economy, promoting healthy living. In a period news article, an officer of the Ft. Des Moines WAAC training center emphasized the role of each American, “you’re big job now,“ said the WAAC lieutenant, “is to train yourself to be of worth to the government; first, train yourself physically to withstand the terrific strain which we must all endure; second, you must be mentally stable.” This was the message of the Hale American Health program that was promoted by many sports organizations, most-notably throughout all levels of baseball. Beginning in 1942, the HALE American “Health” shield patch began showing up on all major and many minor league teams’ uniforms. As the war progressed, the “HEALTH” lettering was dropped in favor of red and white stripes. Naval Air Station Jacksonville – 1943. This road gray uniform is one of my favorites with the Naval Aviator’s gold wings with NAS JAX (in chenille) on the left breast and the U.S. shield patch on the left sleeve. The Health patch found its way onto military team uniforms during the war in different variations. In researching photographs, most of the patches adorning military baseball team uniforms were with the red and white vertical stripes. One variation that I have, as yet, been unsuccessful in locating a real-world example of has “U.S.” superimposed over the vertical stripes. This 1955 jacket or sweater patch originates from an Air Force team from the Kunsan (Korea) Air Base and was most-likely, locally made. My Kunsan Air Base baseball team patch is fully-embroidered and appears (by the construction) to have been made locally in Korea. The practice of patching military baseball uniforms continues much in the same way today as with professional teams. Collectors need to be savvy to discern what is authentic or reproduction or to distinguish the difference between military and civilian baseball patches. Photographic evidence helps to provide some measure of provenance (photo albums from the veteran who wore the original baseball uniform; the source of the patch) and should be paired with the patch, if at all possible. Unlike military uniform adornments, patches from service uniforms are rather scarce. Though I have been searching, I have only successfully landed one such patch for my collection. In an upcoming article that I am presently researching, I will be focusing on another armed force patch that was worn on a handful of major league uniforms by veterans who returned from WWII. Stay tuned.